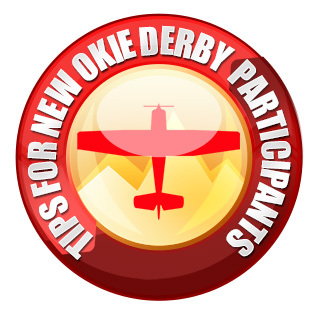 If you haven’t participated in a proficiency derby before, here are some tips to help you get a feel for what’s coming. You’ll find that it’s tons of fun that will sharpen your piloting skills as well! The ground speed that you put down on your entry form is translated into the time you are allotted to fly the course. Generally, the speed (in nautical miles per hour) you put down should be considerably slower than your normal cruise speed. Also, you will have to absorb certain distances for safety procedures (like flying the length of the runways at each airport) that are not counted in the official course distance. The official course distance is measured from the center of the airport to airport. The distance is divided by your speed to determine your allotted time to fly the course. For example: the official derby distance is 210 miles and you say you’ll fly at 101 miles per hour then your time handicap to fly the course is 2.079 hours or 124 minutes and 45 seconds.Your time begins the moment you pass a designated line on the runway during your takeoff roll and ends on your return flight at a designated timing line in the air (generally abeam the light pole at the entry to the terminal on the downwind leg). You turn in your estimate of the total fuel your aircraft will use in gallons and tenths on the morning of the derby. Ensure to account for taxi time. Your tanks are fueled in your assigned parking space on the ramp the day of the derby. Your tanks are fueled again upon your return to the parking space. The meter is covered, but you get to look into the tanks and tell the fueler when to stop.A practice run is helpful. What you want to end up with is a gallons/hour you can apply to your actual time handicap on derby day. Consistency is the key. You want to repeat on derby day what you did on your practice run.Can you use a fuel meter, etc? Sure! But lots of us have won just using a little practice and consistency. For instance, fly at a constant power setting. After takeoff, adjust to this power setting and do not change it again until after you fly the timing line on return. Safety is always the number one consideration. If you’ve estimated a slower speed and find that you’re going to arrive way ahead of your handicap time, how do you eliminate the extra time? If you reduce power, you’ll likely mess up your fuel estimate. One suggestion is to leave the course to the outside and then, when you’re out of the way of other aircraft, do your 360’s or maneuvers to add your time. When you’ve burned off enough time, return to the course and complete your flight. S turns and maneuvers within a certain distance of the finish line are usually prohibited for safety reasons, but you can slow down by lowering your flaps, etc. in attempt to fly across the line as close as possible to your handicap time. Practice using a stopwatch to keep track of your time. Most pilots like to have more than one in the aircraft. You can use a GPS but good old pilotage and lines on the chart will work just as well! Good luck!